This is the title of Arvie Smith’s 2018 mural facing Martin Luther King Jr. (MLK) Boulevard at Alberta Commons Natural Grocers, 5055 N.E. MLK Blvd. The 10-by-17-foot porcelain enamel panel is a permanent installation of the Alberta Commons building. The mural is one of two murals to be installed. The other mural, “Until We Get There” by artist Mehran Heard, will be of the same dimensions and will face Alberta Street. “Still We Rise” is a nod to Maya Angelou’s 1978, 240-word poem “Still I Rise.” Arvie’s multi-paneled mural is a narrative of Portland African-American history from last century to the present. 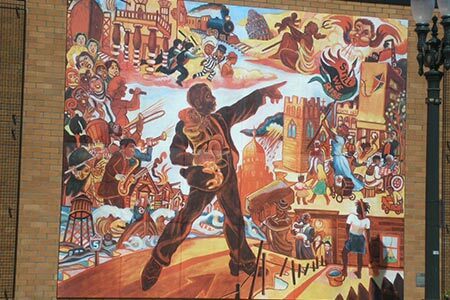 Icons embedded in the mural’s field provide clues to the forces and elements that shaped, negatively or positively, the Portland black experience. Reading the mural, starting at the lower left corner and progressing clockwise, several main themes emerge. The central figure stands on a roadway posted as “I-5.” Scenes of flood waters and home destruction morph to a nightclub band scene. The flute guy in the band, clad in yellow, is Arvie Smith. The 11 o’clock position, offers scenes of occupations and police brutality. The 1 o’clock area tells the story of the impact the Emanuel Hospital expansion on the community’s viability. A broad red line dominates the 5 o’clock space. Arvie is a long-time northeast neighbor and, in 1984, became the first African-American graduate of Pacific Northwest College of Art, where he earned a bachelor’s of fine art. He received his master’s in fine art from Maryland Institute of Art in 1992. His work has been featured in numerous Baltimore and Portland galleries, including the Portland Art Museum. Editor’s note: If you’d like to know more about Arvie Smith and Maya Angelou, their lives and their art, Karen shares her resources online. Visit ConcordiaPDX.org/still-we-rise.